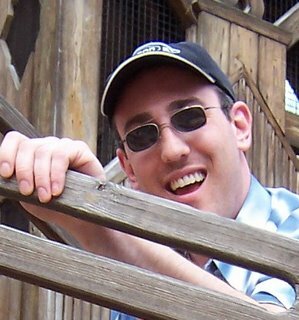 scott's ravings: Raccoon Number Two! The Harrises are becoming quite the family of trappers. 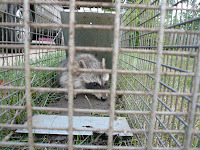 We captured our second raccoon (along with the help of Dan's Garden of Raccoonly Delights). This little fella looked a little smaller than the previous one. Unfortunately, it's not raccoons we're trying to catch. Just as Dan pulled out the trap from his garden, a big fat woodchuck lumbered down the hill, looking back at him as if to say, "You can't get me!" We probably can't either. 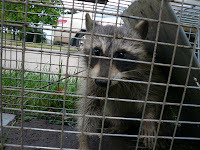 Since raccoons are omnivores, they will go for the catfood and crackers in the cage. But I think woodchucks are herbivores, which means they will only be tempted by green stuff. The problem is, if you pick any green stuff to stick in the cage, it wilts and doesn't look tasty, and the woodchuck will always prefer the fresh stuff outside the cage. I don't think you can catch a woodchuck in a cage. But we're getting pretty good at raccoons! Becky's picture of the other one was better. Yes, but is it kosher?